My 2011 MacBook's hard drive recently went kaput on me and I replaced it myself. You can click here to read all about that process. Turns out it was extremely easy to do. In fact, replacing the hard drive was so easy I came crashing down when I realized getting the OS (operating system) onto the new hard drive was going to take a bit of research and much more time. Replacing the hard drive was under 30 minutes to complete. However!! Due to a couple of issues, getting the OS onto the hard drive took an hour!! And then it took another hour before the computer was actually functional for use. A full two hours, people! 1. In recovery mode I chose to (re)install the Sierra OS via the internet but the hard drive was not an option for which to place the system on. I tried and I tried. Several hard shut downs (by pressing the Power button for a few seconds) and the hard disk never appeared as an option!!!! I'd choose my WiFi and enter my password and then choose to install the OS and would be met with a message that made me cringe: "Untrusted_Cert_Title". And that was it. I could go no further. I eventually had to get my Google on. 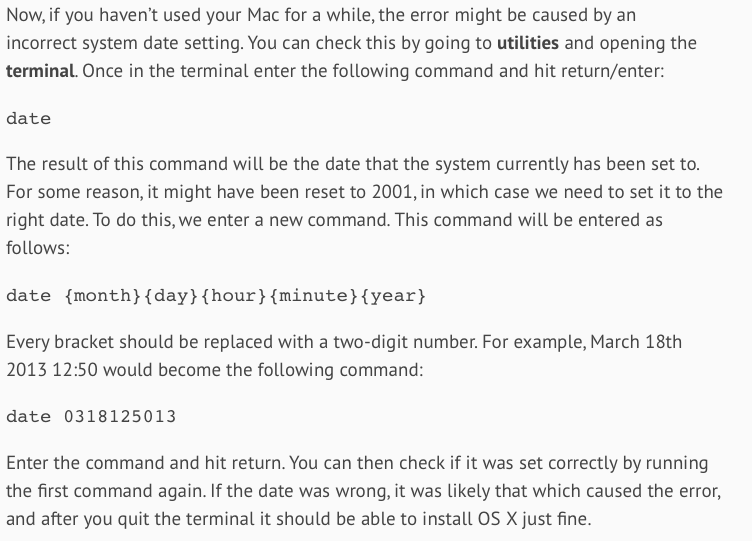 I found the most bizarre solution: check the terminal for the date and time. If incorrect, this is your problem. Correct it and try again. And it worked! Great, right! Now I'm on track. All I have to do is go back, install the OS via internet and be good to go! That turned out to be a big SIKE! 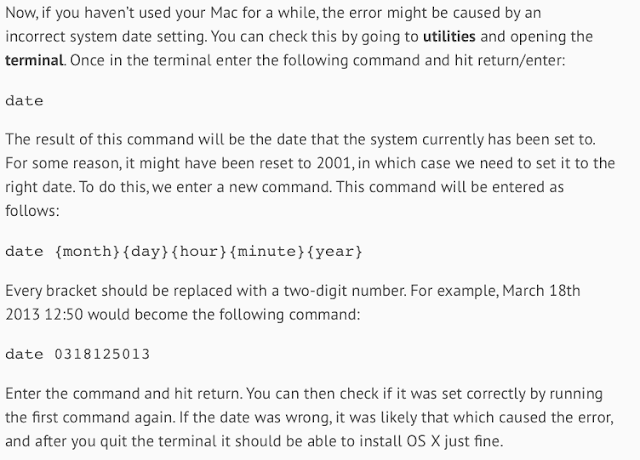 I tried to install Sierra again after correcting the computer's date and time, but still, I needed a place to put it. (Why couldn't I wrap my head around this reality???) The new hard drive is still not showing as an option. Once done with the above instructions, close disk utility and voila! I was then able to successfully get the OS onto the hard drive and use my 'Book. Start to end it took me TWO HOURS!! So, I give to you this comprehensive solution to the two issues I encountered to save you time and frustration. Had I known these solutions at the beginning.... Had I sought solutions instead of thinking shutdowns would make a difference and produce a technical miracle, I could have saved myself at least about an hour, I believe.